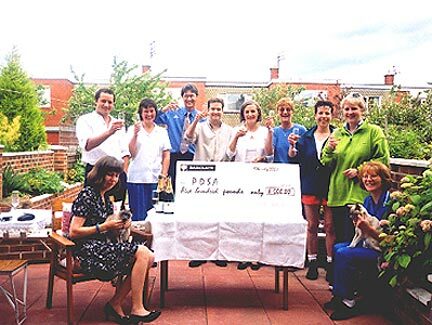 Spock and Dracs invited some of the people who'd helped them most with their project to come and watch them hand over their first cheque. It was for £500. They're hoping they can sell a lot more copies of both books and that their next cheque will be for much more. Ann, Spock and Dracs would like to take a further opportunity to say "Thank you very much indeed" to everyone who's helped them, especially those pictured below. Clockwise from the left are, Ann (translator and editor), Richard (illustrator - not one of his best shots! 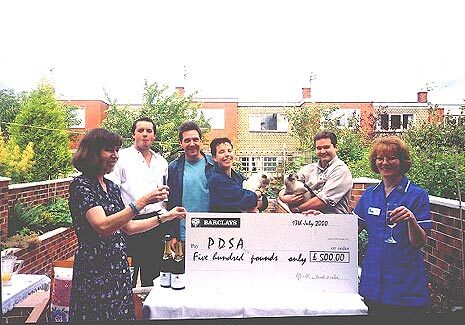 ), Bruce (graphic designer), Mary (editor Uk Pets), Dracs (co-author), Spock (co-author), Paul (website designer), Marion, (senior veterinary nurse at the PDSA's Newcastle clinic). to Ann's the other day. males too - well good looking as human's go that is. one of those human ones better than us?. Spock: Don't be silly Dracs, she calls us beautiful blue eyed boys. Spock: Don't be silly. There's nothing to worry about. Dracs: What do you mean? Spock: Think about it! Did you see her scratching their necks? Spock: Did she roll them over and tickle their tummies? Spock: Did she invite them to jump onto her lap? Spock: Well there you are then. She still does all those things to us. favourites. I was stupid to worry. Spock: So can I go back to sleep now? Dracs: Yes, sorry Spock. Night night.